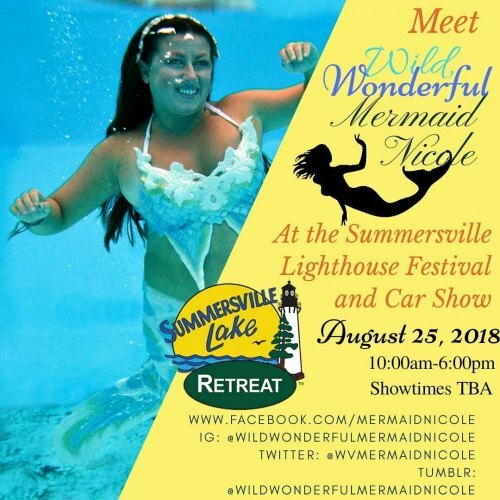 Mermaid Nichole , based near Charleston, WV, will be a guest at the Summersville Lighthouse Festival and Car Show today, Aug. 25! At the show you can get your photo taken with a mermaid, grab a t-shirt, climb a lighthouse, visit the lake, is there a better way to spend the day? Wild, Wonderful Mermaid Nicole considers herself a real life mermaid. She teaches swimming lessons and loves to swim by to add a little underwater magic to your events. She is available for Private Parties, Birthday Parties, Large Corporate Events, Charitable Events, Swimming Lessons Private and Classes, Mermaid Classes and more. Mermaid Nicole is the first professional Mermaid in West Virginia. Raised in the Kanawha River she has been swimming since the tender age of 2. She always dreamed of being a mermaid and used to sing songs to the river in hopes of soothing it's pain due to the pollution that was evident. She joined the Nitro City Swim Team at age 9 and continued on to become the Coach. In high school she was on the State Champion Nitro High School Swim Team. She has worked as a Lifeguard and Swim Instructor for the Nitro City Pool for 16 years. Her love for the water has always made her a conservationist as well as a humanitarian and she supports and works with several organizations in hopes of making our world a better place. Her other love is to dance, what Mermaid doesn't dream of having feet just to dance? She started dancing with Regina's Studio of Dance at 2 and continued there up through college where she went to Marshall University and studied Acting/Directing at their wonderful Theatre Program. She decided to combine these two loves and become what she had always been, a MERMAID!!! Bringing entertainment and water safety together to make your dreams come true. An inhabitant of two worlds, she loves flipping her fins and swimming under the sea as much as she loves dancing in the sand and relaxing in the sun. Water sports tend to draw her attention and you will often find her kayaking especially on the Coal and Kanawha Rivers. She believes all of us are children of two worlds, the real one and the one we create in our imagination. She just decided to make the one in her imagination her reality. She invites everyone to do the same.